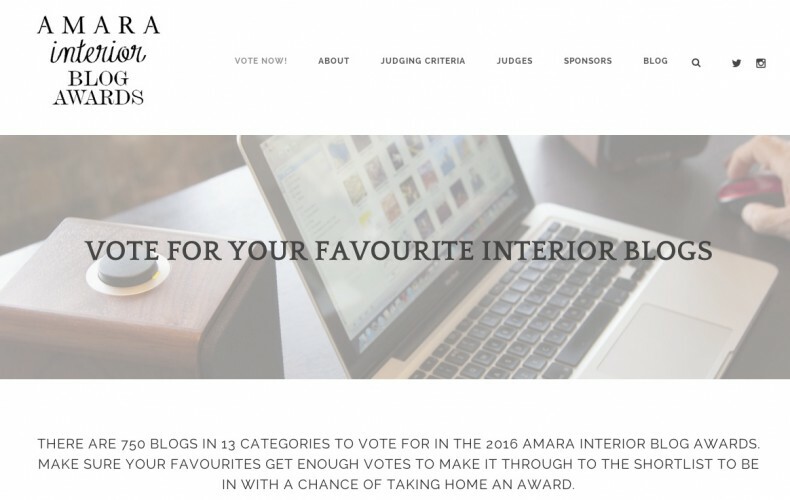 Last year, 286blue attended the Amara Interior Blog Awards on behalf of Copperline. Copperline had been nominated and then short-listed for Best Designed Blog. As 286blue designed the site, it made sense to attend on behalf of Copperline who are based in Scotland. It was great that the judges selected Copperline which won the Best Designed Blog award and it was a pleasure to accept the gong on behalf of Fiona. Sadly, the category made it’s last appearance in 2015 which is perhaps a good thing – Copperline is now officially the Best Designed Blog according to Amara for eternity. Anyway, to 2016 and it’s wonderful to see that four sites designed by 286blue have been nominated. Yes, four! Obviously the credit goes to the hard work and great writing by the bloggers of each site but I hope the design has acted as the supporting actor. Elevating and reflecting each writer’s outlook and aesthetic, the styling, logos and brand identities instantly convey each site’s personality and background through 286blue’s precision branding. Newly launched this year, Grace & Favour has been nominated for Best Newcomer Blog. Grace & Favour is a new website for independent interior designer and Farrow & Ball colour expert Rowan Davis-Downs to post thoughts, news, and projects. Copperline, Mad About the House, and Home Arty Home are all nominated in the very busy category of Best Design Inspiration Blog – each with their own unique style and design outlook, goodness knows how the judges will choose should they make it through to the next stage.